Hanley Ramirez will avoid disabled list for now after encouraging MRI result. 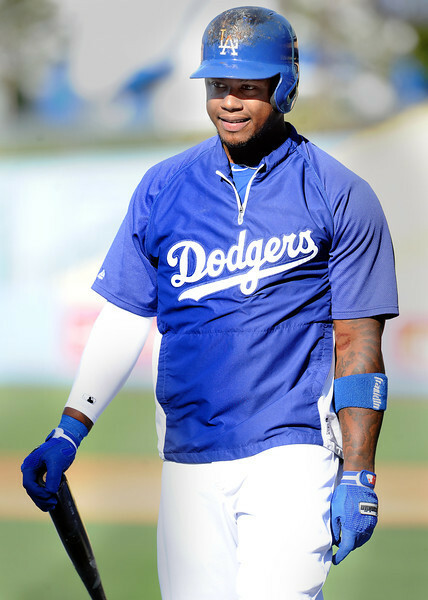 Two days, Hanley Ramirez says. That’s all he needs. It wasn’t “two days,” but the Dodgers’ medical staff had some good news for Ramirez Monday. An MRI on his strained left hamstring revealed no further damage, and he may be able to miss the disabled list altogether. The Dodgers have gotten 23 plate appearances out of Ramirez this season and don’t want to exacerbate his latest injury. So why not put him on the DL? Isn’t this a repeat of Mark Ellis‘ strained right quad in April — an injury that ultimately forced Ellis to miss 19 games but didn’t land him on the disabled list until May 6, a full 10 days later? Ramon Hernandez, Luis Cruz, Scott Van Slyke, Justin Sellers and Skip Schumaker are the other reserves available to the Dodgers off the bench tonight. Sellers was recalled from Triple-A Albuquerque, where he was batting .337 with one home run and 17 RBIs in 24 games, and optioned Matt Magill to Albuquerque. Magill took the loss Sunday against the Atlanta Braves. This entry was posted in JP on the Dodgers and tagged Hanley Ramirez, Justin Sellers, Matt Magill by J.P. Hoornstra. Bookmark the permalink.